Children's drawings are visual representations made with crayons, markers, or pencils that are generated for pleasure but can also be used for therapeutic purposes or developmental assessment . Children's art, especially a drawing, represents one of the delights of childhood. The child's artistic endeavors are mainly produced for pleasure and the exploration of art media. They can also be used for developmental and therapeutic assessment. Children's drawings obviously show artistic development and expression. In educational and clinical settings, they can be vehicles for assessing a child's personality, intellectual development, communication skills , and emotional adjustment. Children's drawings can also aid in helping to diagnose learning disabilities. Law enforcement officers, social workers, and counselors often have children draw traumatic events, especially when they lack the communication skills to explain what they have witnessed or experienced. Children may also feel distanced from the traumatic event by drawing it and talking about what is happening in the picture, as if discussing a character in a book or on television. Color analysis has often been a means of determining a child's emotional state. A lot of black or red recurring in a child's drawing may be a troublesome sign. Black often is an indication of depression or feeling hopeless or restricted. Red may indicate intense anger. Blues and greens are usually calm colors, and yellows and oranges often indicate cheerfulness. Therapists are not ordinarily concerned if a child does one drawing in one of the troublesome colors, but may want to investigate a series of dark drawings, especially if the content is also frightening or disturbing. Therapists may use the therapeutic session as a means of emotional release and may encourage a child to create drawings that express their deep fears and angers. Drawings in this case are not assessment instruments, but become therapeutic tools. In 1975, Viktor Lowenfeld launched a theory of artistic development based on systematic creative and cognitive stages. Each stage demonstrated specific characteristics and had an age range. He encouraged the use of his artistic development stages in classrooms and as guides for parents. These stages are as dependent on a child's exposure to art and art media as they are on a child's innate artistic ability or fine motor skills . It should be noted that because a child does not seem to go beyond a specific developmental stage, it does not mean that the child has a cognitive or developmental problem. This apparent arrest of development may be due to limited exposure to art, lack of interest, or fine-motor differences. Cultural values can also affect artistic expression and development, influencing content, art media, style, and symbolic meaning as represented in the child's view of the world. The following stages are generalized from Lowenfeld's work and that of Betty Edwards. Both theories show children moving from scribbling through several stages to realistic art. Children may overlap stages, making drawings with elements of one stage while progressing or regressing to another. Generally, boys and girls will develop similarly in the initial stages. Whether any child progresses to the latter stages usually requires instruction of some kind. SCRIBBLING STAGE The scribbling stage usually begins around two years old and lasts until the child is about four years of age. In some cases, it can begin as soon as a child can hold a fat crayon and make marks on paper, which is sometimes around 18 months old. At first, the child is interested only in watching the color flow on the paper. Some children are more interested in the marking itself and may even look away while scribbling. What results on the paper is accidental and often delights the child, even though it is indistinguishable to adults. With about six months of practice, the child will be more deliberate and may start drawing circles. Later, the child will name the drawing, saying, "This is a dog." The child may even look at the drawing of the dog the next day and say, "This is Daddy." The child will also start drawing people that resemble a tadpole or amoeba (a circle with arms and legs, and sometimes eyes). PRE-SCHEMATIC STAGE The pre-schematic, or pre-symbolic, stage begins around age four; however, it may start earlier or later, depending on the child's cultural and artistic experience. In this stage, the amoeba or tadpole people may have faces, hands, and even toes, but no bodies. These figures face front and often have big smiles. Omission of body details is not a sign that something is developmentally wrong. It just means that other things in the drawing of the person are more important. For example, heads are the first objects drawn and may continue to be bigger than other parts of the body. This is usually done because the child sees the head as being very important. The child eats, speaks, sees, and hears with parts of the head. Colors are selected on whim and usually have no relationship with what is being drawn. Figures may be scattered all over the page, or the page turned in every direction as the figures fill the paper. Objects and figures may appear to float all over the page because children do not yet know how to express three-dimensional objects on a two-dimensional surface. The child's self-portrait appears as an amoeba person, but it will usually be the biggest figure, appearing in the center of the page. The child may test different ways to draw a self-portrait before settling on one for a period of time. In this instance, art helps define a child's self image. SCHEMATIC STAGE The schematic stage usually begins around seven years old and extends through age nine. At this time, the child has developed specific schema, or symbols for people and objects in his or her environment, and will draw them consistently over and over. Human figures have all necessary body parts. Arms and legs also fill out, instead of being stick-like. This is usually due to more body awareness and recognition of what body parts do; e.g. parts of the body help the child run, catch a ball, jump, etc. Adults usually have very long legs because that is how children see them. Houses and people no longer float on the page. They are grounded by a baseline that acts as a horizon line. As the child continues to draw, there may be two or more baselines to show distance or topography. Children may also draw a series of pictures, like cartoon squares, to show action sequences over time. This seems to reflect a child's desire to tell stories with the drawings. By eight or nine years of age, children will often draw their favorite cartoon characters or superheroes. REALISTIC OR GANG STAGE The realistic or gang stage begins around nine years old. Here, the child begins to develop more detail in drawing people and in determining perspective (depth or distance) in drawings. Shapes now have form with shadows and shading. The people they draw show varying expressions. Colors are used to accurately depict the environment, and more complex art materials may be introduced. Children at this stage are eager to conform and are very sensitive to teasing or criticism from classmates. They also are very critical of their work, individually or when it is compared to the work of others. Children at this stage can be easily discouraged about creating art if they are overly criticized, teased by their peers, or become frustrated with art media or problems expressing what they see in their minds. This is the time to begin quality art instruction, where children receive the technical training in mastery of art media, perspective, figure drawing, and rendering (shading). Somewhere between ages 12 and 16 years, children face a crisis in artistic development. They will either already have enough skill and encouragement to continue a desire to create art, or they will not. If it is only a matter of training, finding appropriate art classes will help the child through this crisis. If the child has been discouraged by criticism or lack of enough art experience or exposure, the child may not continue to draw or partcipate in visual art activities. Some discouraged children may change to a different art medium. For example, a child may not draw or paint again, but may enjoy making clay pots or welding metal sculptures. Other children will find alternate ways to express their creativity . For example, a child may become involved with auto detailing, fly-tying, sewing, or needlework. Still others will never participate in any other kind of artistic activity and may ridicule or disdain those who do. Generally, children's drawings are no cause of alarm, despite color choice or content. They are merely artistic expressions and may present a variety of emotions, representations, and themes that are explored and then discarded. Nevertheless, if a young child is repeatedly drawing violent pictures, there may be reason to seek out a therapist for the child to see if deeper emotional issues exist. For teenagers, especially those who are artistic, entertaining a dark period or even a quasi-violent Goth or vampire series of art work may simply be artistic exploration of darker themes. If this period of art work is coupled with risky behaviors or depression, it may represent a cry for help and therapy may be appropriate. Other indicators of possible emotional problems may be drawings of a particular object or person much bigger than a drawing the child makes of himself or herself, or a drawing of a human figure in disjointed parts. In these cases, a child should be evaluated by a therapist because drawings of this sort usually indicate being overwhelmed by something or feeling fragmented. Drawings with incomplete or hesitant lines may indicate that a child feels unsure or insecure. Children who make these drawings may just need encouragement. Further evaluation may be necessary if these kinds of drawings continue for a long period of time. Since artistic expression and appreciation is an element of a balanced life, encouragement by parents and other adults is essential. Adults can encourage art expression by offering art materials to children at an early age. Even toddlers can make drawings with fat crayons, as crayons are non-toxic. Art materials should be good quality. The materials do not need to be expensive, but they should be good enough so that they perform as they are intended. For example, a child may be given a set of colored markers; but if they do not flow well or are dried up, the child can become discouraged because the tools do not function properly. Children also enjoy experimenting with a variety of art materials. Using chalks, pastels, charcoal, and pencils of different softness expands the artistic possibilities that crayons and markers begin. This variety allows a child to explore different media and how they behave. No child is expected to become the master of any or all of these media, but the experience with each helps them expand their artistic voice and opens up greater appreciation for artwork by others found in museums or created by their fellow classmates. 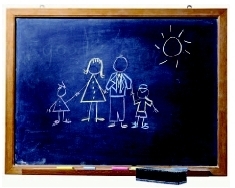 Drawing by a young child depicting a family. supposed to look like photographs, but are each person's view of the world. Children's drawings become expressions of how and what each child sees. Adults can help children understand that art is self expression and that there is nothing wrong with what the child chooses to express. Artistic risk taking, experimentation, and the development of meaning are intrinsic to making art, and children can begin to understand these concepts through their own artistic efforts. Exposure to a variety of visual art at an early age can encourage a child's lifelong appreciation of art. This can be in the form of quality children's picture books that have beautiful illustrations. Trips to art galleries and museums can broaden a child's exposure to a variety of artists, styles, and content. Visiting artists at art shows or art fairs can also be a way to show children how artists work or handle different media. Adults can extend this exposure through discussions about the art works and talking about media or content. Children's responses to their own drawings and their perception of the level of their competence is often affected by the attitudes of their peers and adults who react to their art work. Direct and indirect criticism of a child's drawings should be avoided. When children are very young, it is sometimes difficult for adults to figure out just what a child's drawing is about. In order to avoid quashing young talent or a child's self-esteem by commenting on the beautiful bee the child drew when it really was a dog, adults can praise the child for having made something wonderful and then ask the child to tell about the drawing. From the answer, the adult can then praise the child's work in context. For example, if the child brings a drawing of yellow and blue scribbles, the adult can say, "What beautiful colors! Tell me about your picture." If the child says the drawing is about a flying horse, the adult can respond, "What a graceful flying horse! Does he like to fly?" The adult can continue to engage the child in discussion about the horse, choices of color, reasons for drawing a flying horse that day, or how the child felt doing the drawing. Criticism can occur constructively when children enroll in technical art classes. There is a context in the art education setting for mastery of art media and technique. The normal preschool or elementary classroom is not the place for this kind of critique. Many children have been so severely criticized by teachers that they never pick up art materials again and some are even turned away from appreciating anyone else's art. Drawings —Visual representations made with crayons, markers, or pencils. Perspective —The way an artist shows depth or distance in a drawing or painting, usually by drawing figures and buildings larger in the front of the picture and smaller in the back. Rendering —An artist's term for shading or creating texture or shape with markings, usually made with pencil, charcoal, ink, or paint. See also Cognitive development . Gaitskill, C., et al. Children and Their Art. New York: Harcourt Brace Jovanovich, 1982. Golomb, C. The Child's Creation of a Pictorial World. Berkeley and Los Angeles: University of California Press, 1992. Levick, Myra. See What I'm Saying: What Children Tell Us Through Their Art. Dr. Myra Levick, 2003. Malchiodi, Cathy. Understanding Children's Drawings. New York: Guilford Press, 1998. Oster, Gerald. Using Drawings in Assessment and Therapy: A Guide for Mental Health Professionals. New York: Brunner/Mazel, 2004. Rubin, Judith. Art Therapy. New York: Brunner/Mazel, 1999. Burkitt, Esther et al. "Children's Colour Choices for Completing Drawings of Affectively Characterised Topics." Journal of Child Psychology and Psychiatry (2003): 445. McDonald, Faith Tibbets. "What Drawings Reveal" Christian Parenting Today. 14, no. 18 (March/April 2002): 20. "Scribbles Can Measure Kids' Development." USA Today (December 2001). Hi. i need some help... im a college student who is going into art therapy. I have been babysitting two boys (age 5 and 3) for a a year now and a few months ago problems have been occuring in their home and the parents are now currently going through a divorce. Although it is really not my place to say whether or not i find a parent to be a good or bad one, but i feel that their mother is not living up to her responsibilties as a parent. The story with her is long and complicated and i feel she has psychological issues to deal with within her own past and childhood (her parents were also divorced, and i heard stories of psychologically abusive things her step father would do to her). She doesnt physically abuse the childs but the fact that she is a stay at home mom and has 4 babysitters including me, and we all seem to work long hours for her (9-12+ hours and even do several overnight stays) and that the kids say they miss mommy and have become violent to me, punching me when she leaves, makes he think that the lack of times she spends with them is some how becoming the abuse. Their father works many many hours and goes on several business trips to support their wealthy life style, and their mother only allows the kids to stay with him every other weekend. One weekend, their mother decided to quickly move out of their large house with the boys, without a word, while their father was on a business trip, he was furious to find she had taken such a drastic step without giving him any reasons. Lately i have noticed their drawings have changed, especially the 5 year old. he draws pictures of the large house with rain clouds and stormy weather and drawing pictures him holding hands with his father and his mother at the bottom corner of the page (when asking him to draw a family portrait). Well, the real question that i have is that i heard once that when a child is drawing a picture of the house they live in, and you give them a variety of colors to choose from, if they decide to draw the house in red and green its suppose to be a bad sign or a sign of some sort. Is that true, given the knowledge that they have been acting differently sinced their parents have been apart and the little time spent with either parent? I have a question: My nephew has started to see ghosts in their apt., he's afraid to go into a room by himself, he draws pictures in his first grade that shows him with a ghost inside him. Does this mean anything particular ? Should my sister be concerned, do anything, say or not say certain things as a response? Or is this normal?